Love is in the air with images reminiscent of moonlight walks dancing into the night and secret rendezvous. 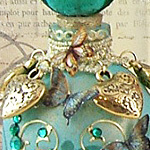 Valentine Frosted Bottle - Patina & Gold by Design Team Member Laura Carson; other components used in the artwork. 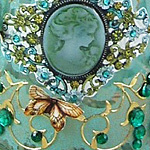 Learn more about this artwork in Laura's Decorative Techniques for Altering Bottles Tutorial.